DorksideToys has also listed preorders for the upcoming TVC Wave 5. You can order via full case (2 of each figure), as a set (1 of each) or as individuals. 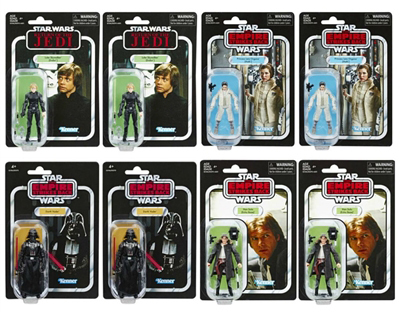 The Last TVC Figures Can Be Yours…. FREE! That’s right! Thanks to our new sponsor dorksidetoys, we will be giving away** a factory fresh case of the last wave of Vintage Collection figures! How does one obtain such a prize? Simple. To honor the TVC line of figures riding off into the twin sunsets of Tatooine, we want you to send us a photo you’ve taken* (along with your name, city & state) of your favorite Vintage Collection (2010-2012) collectible. From today until Oct. 30 we will post the photos in a dedicated album on Facebook, then on Oct. 31, 2012 we will pick a winner at random. To enter, please send your images and info to: news@yakface.com with “Yakface/DorksideToys TVC Giveaway” in the subject line. Good luck, and MTFBWY. *Only one submission per person/email address will be allowed. All images, once received, become the property of Yakface.com to use in this and future promotions and advertising as we see fit. Dorkside Toys updates this week with news of what’s in stock, available for pre-order, and on clearance at www.dorksidetoys.com and also available on their ebay store. Click on through to check it out!